In Chicago, A Test Of Wills Over A Budget Deficit Former White House adviser Rahm Emanuel is no stranger to tough negotiations. And as Chicago's new mayor, that's where he finds himself now. Faced with a daunting financial hole next year, the mayor has proposed laying off hundreds of city workers. In Washington, congressional leaders and the White House are in a financial fight that's being watched around the world. But outside the Beltway, in cities large and small, mayors are grappling with their own economic challenges. In Chicago, Mayor Rahm Emanuel is no stranger to tough negotiations. And, fresh from his second stint as a White House adviser, that's where he finds himself now. Emanuel's predecessor, Richard Daley, left him a daunting financial hole. Chicago faces a $600 million budget gap next year — not to mention the $31 million deficit this year. 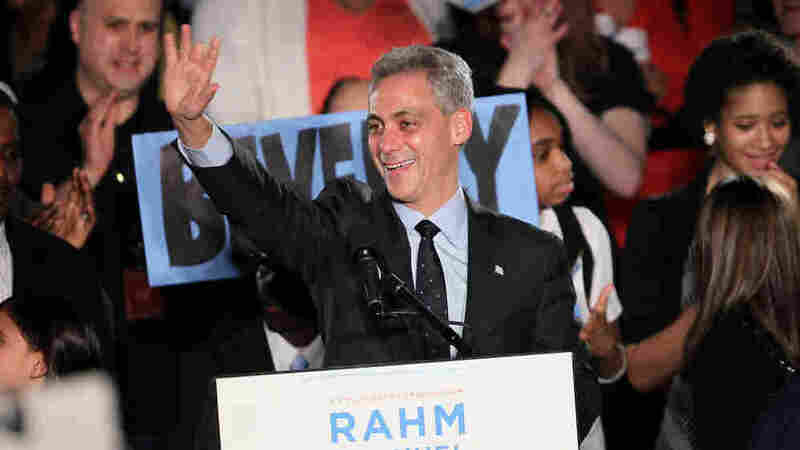 As part of the solution, Emanuel decided that more than 600 city workers should be laid off. "My duty as mayor is to protect our city's taxpayers and be their voice — not to protect the city's payroll," he says. This week, union leaders said if Emanuel wants to cut jobs, maybe he should look to middle managers who fill the offices of City Hall. Compromise is not going to get [Mayor Emanuel] to where he needs to go. He's got to take some really hard positions eventually, and I think he's going to be dealing with a lot of angry people. There is no way to sugarcoat this. "We think before you outsource anything, or before you look to cut anything or look for anything else from your workers, you should at least be managing the city in a way the taxpayers really demand — and that's [as] efficiently as possible," says Jorge Ramirez, the head of the Chicago Federation of Labor, one of two umbrella groups representing about 8,000 city workers. Under the budget created by Daley, city workers agreed to several furlough days in order to prevent layoffs. But that concession expired in June, and Daley did not negotiate an extension before leaving office. In his news conference, Emanuel shot back at the union leaders: "No part of the budget — any part of the budget — from the mayor's office, to work rule reforms and everything between those boundaries is not off limits, it's on limits." Meaning everything is on the table. While the mayor was clearly miffed, this was not a raucous Chicago-style smackdown — not yet. Things are still fairly civil, but maybe not for long. Roosevelt University analyst Paul Green says Emanuel was elected with 55 percent of the vote in part because of his reputation for making tough decisions. And he says that when it comes to Chicago's deficit, Emanuel may have to stop negotiating and make some tough calls. Unemployment numbers are seasonally adjusted. The city of Chicago is in Cook County, Ill. Per capita personal income is for 2009. It is defined as income received by persons from all sources, including but not limited to the sum of wage and salary disbursements, supplements to wages and salaries, rental income, and personal dividend income. "Compromise is not going to get him to where he needs to go," Green says. "He's got to take some really hard positions eventually, and I think he's going to be dealing with a lot of angry people. There is no way to sugarcoat this: There are really difficult budget choices to be made, and you can't finesse it." Chicago is a world-class city, with a vibrant downtown, Fortune 500 businesses and major league sports teams, all set on the shores of Lake Michigan. But like many other cities, the recession dealt Chicago a harsh blow — one for which it wasn't prepared. "Chicago entered the Great Recession with no reserves, with an operating deficit, and with no long-term plan on how to get through this financial challenge," says Laurence Msall, president of the Civic Federation, a local government watchdog group. That challenge is expected to add up to a massive $600 million to $700 million deficit next year. Msall says Emanuel is on the right track. He used an executive order to create a long-range financial planning process, and the budget is one of his top priorities. For the past couple of weeks, the mayor has held news conferences — showcases, of sorts — to detail how the city is working to shave costs. At one of the city's water filtration plants, the Jardine plant, department heads say they're changing "business as usual" procedures. Water department officials say instead of tearing up streets to repair sewers, they'll install more liners that extend the life of the city's sewers; two other departments plan to merge, and the city will reduce the size of its vehicle fleet and install Zipcar technology so workers share cars. Emanuel says the group came up with initiatives to save $14 million. "I asked everybody ... to go through the budgets, not get stuck to old ways, but ask some fundamental questions, going line by line, which is, is this the best way to deliver this service?" Labor leaders say the efficiency report they've offered Emanuel could save Chicago as much as $242 million. It's a familiar theme — dueling ideas about what to cut and how.